In 2015, the Series 55 and the Series 56 will be combined to become the Series 57. The Series 57 will not have a prerequisite. A Series 57 rep will need the Series 24 to become a principal. In 2016, FINRA will begin a new exam, to be called the Securities Industry Essentials exam (SIE). The SIE will cover basic security industry knowledge and will become a prerequisite to the Series 6, Series 7, Series 22, Series 57, Series 79, Series 82, Series 86/87, and Series 99. You will not need be sponsored by a FINRA member firm to take the SIE. SIE exam results will not appear in BrokerCheck. Those who are currently registered will be grandfathered in and will not need to take the SIE. Individuals who have been out of the industry 2-4 years will only need to take the top off. Individuals who have been out of the industry for more than four years will need to take the SIE and top off. FINRA will be retiring the Series 62 exam. 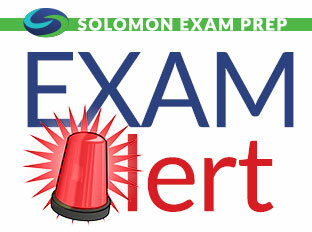 Follow Solomon Exam Prep as we keep you up-to-date on these important changes. Effective October 27, 2014, FINRA has revised its arbitration rules regarding when arbitrators may refer matters to FINRA for disciplinary investigation. Arbitrators may now make such referrals during an arbitration if they become aware of an issue that they believe poses a serious threat that will harm investors unless immediate action is taken. Previously, arbitrators could not make referrals until the conclusion of a case. This alert applies to the Series 6, Series 7, Series 24, Series 26, Series 62, Series 79, and Series 82.